YouTuber “HomoFaciens” had quite a bit of square tubing to cut for his latest CNC router. As he’s known for combining simple tools with creative uses of electronic components, he came up with a jig that helps him precisely position his cuts. 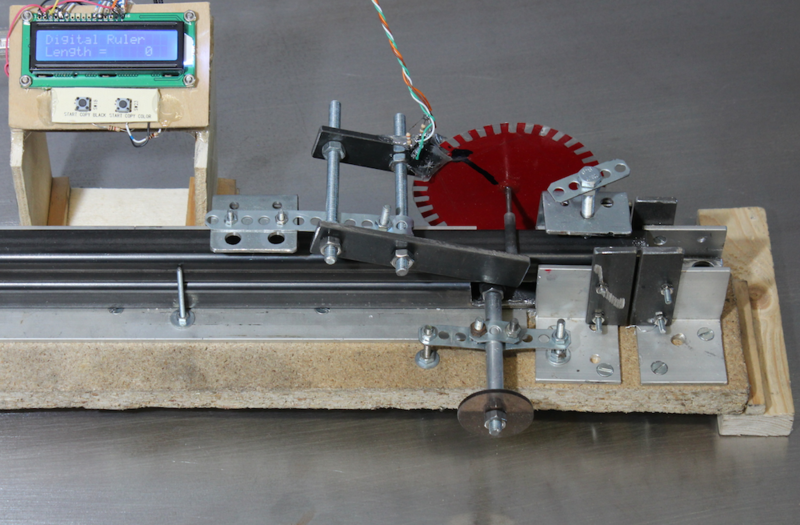 This device works using an encoder made out of paper, tape, and a nail sharpened on both ends. Two IR emitter/receiver pairs send pulses to an Arduino Uno, which displays this number on an LCD screen. The machine is calibrated by measuring a known length of tubing verses the number of pulses for an actual distance measurement. Once set up, not only can the digital ruler be used to properly cut tubing, but can be put on a drill press for accurate hole placement! Interested in building your own ‘little helper?’ Read more about the project on HomoFaciens’ page here, and see it in action below!